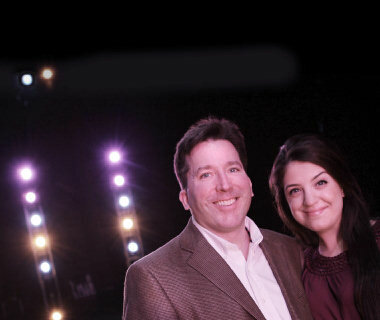 Prof. Bill Wilson and theater student Talia Triangolo are in the spotlight at Rhode Island College. For Talia Triangolo, there couldn’t have been a brighter ending to her time as a student at Rhode Island College. Last month, the 23-year-old senior from Providence and four classmates were invited to the John F. Kennedy Center for the Performing Arts in Washington, D.C., to open the annual American College Theater Festival. She sang “No Time at All” from “Pippin,” the musical RIC took to the festival’s regional finals in Fitchburg, Mass., in January. Although the show failed to make the nationals, Triangolo, a double major in musical theater and communications, was singled out for the special honor of opening the festival April 22, something that, as far as anyone knows, has never been offered before. She got her own dressing room with her name on the door and ended the evening with an “overwhelming” response from the audience. DaSilva came to RIC to check out the show, and found it so impressive that he gave Bill Wilson, musical theater head at RIC, first crack at his new “Fame” sequel, “Fame Forever, Talent Springs Eternal.” DaSilva, who made a donation to the department, said he’s looking at a 2013 production date. “It’s been a banner year for us,” said RIC president Nancy Carriuolo, who flew to Washington with her husband and 28-year-old son to cheer on Triangolo and friends. While RIC’s theater has been cooking in recent weeks, fame is nothing new to this small, tight-knit department that produced an Oscar nominee in Viola Davis, and numerous graduates who have gone on to impressive careers in New York and elsewhere. “I’m pretty pleased with the graduates,” said Wilson. He called the current crop of students the strongest he has seen in his 14 years at the college, and predicted big things for Triangolo. “She’ll be successful,” he said. Triangolo, active in theater in high school at La Salle, sort of stumbled into the RIC theater program. She had hopes of going to Emerson College in Boston, but the money didn’t come through. So at the last minute, in a move she described as a “shotgun” college choice, she went to the University of Rhode Island. It took just three days to realize the school wasn’t for her. There was no music theater major, and she, being a double major in communications, wasn’t hot on what URI offered in that area. So a couple of weeks into the semester, Triangolo called RIC and made an appointment with Wilson, who told her she would do well there. Naysh Fox, a 20-year-old junior from Wyoming with a double major in musical theater and dance, also started out at URI. He was there a semester when he met RIC choreographer Angelica Vessella while in “Oklahoma” and followed her to RIC. Fox said he liked URI, but, like Triangolo, was looking for a department that offered a musical theater major. Upperclassmen at RIC, students like Triangolo, have been very helpful, said Fox. “I’ve grown because of Talia,” he said. Fox also went to the Kennedy Center and shared the stage with Triangolo. “Incredible! So cool!” he said of the experience. Triangolo, the daughter of a Providence city worker and cosmetologist, went through RIC on full scholarship, acting in professional theater on the side. Last summer, she was in Theatre By The Sea’s “The Full Monty” as Joanie and understudying for Pam, the female lead. She recalls going on as Pam the first week of the run — without a rehearsal. “That was the scariest thing I’ve ever done,” she said. By all accounts, Triangolo is a natural. Triangolo began piano lessons at age 4 and took up singing in the sixth grade, in school and church choirs. Her parents, Joseph and Karen Triangolo, took her to see “Hello Dolly” with Carol Channing at the Providence Performing Arts Center when she was 8. As a teen, she acted in All Children’s Theater, and took part in PPAC’s Camp Broadway. But it was at RIC where she blossomed, where she took dance and voice lessons and become what is known in show business as a “triple threat,” someone who can act, dance and sing. There was a time, said Wilson, when a singer could land a Broadway role on vocal talent alone. Now, he said, singers have to act and dance. Triangolo’s invitation to sing at the Kennedy Center came “out of the blue,” she said, and appears to be unique. Normally, the festival, the umbrella for the Irene Ryan Acting Scholarship Competition, opens with a recording of Ryan singing “No Time at All,” the same song Triangolo sang from “Pippin.” Ryan, who played Granny on “The Beverly Hillbillies,” was known for her Broadway portrayal of the show’s Berthe. At the Kennedy Center, a few bars of the recording were played as an intro, and then the lights came up on Triangolo, who sang the song live. While she’s not sure why she was picked to open the festival, Triangolo assumes it was because of her outstanding performance of “No Time at All” last January in Fitchburg. She stopped the show, while the audience gave her a two-minute standing ovation. “We were on fire,” said Triangolo of the Fitchburg performance. Triangolo, one of about 20 musical theater majors at RIC, plans to take some time off to travel after graduating this month, then commute to New York for auditions. She has her sights set on a national tour of a musical. So what makes the RIC theater department so nurturing to students like Triangolo and Fox? Triangolo said having a small campus and small department help, but credited her teachers. They take into account the individual, she said, and “don’t just turn out musical theater robots. That’s why we get jobs. Most RIC theater students are Rhode Islanders, children of working-class parents, who have a strong work ethic, said Wilson. Some are the first in their families to go to college, he said. But that is changing somewhat, said Vessella, who added that her dance students now come from throughout the region.